Being a Christian. And a writer. At the same time. Like many of you, I’ve been watching the Olympics this week. Talk about excitement! Michael Phelps and Nastia Liukin, they take my breath away. I was thinking this week as I watched how these athletes have worked so hard to make their dreams come true. But the truth is, they were also blessed with natural abilities that made those dreams a possibility. With all the training and practice in the world, I never could have been a Shawn Johnson, even if I had started when I was six. And that of course, like everything else seems to, leads me to think about this writing thing I’m doing. Part of me wonders–ALL THE TIME–if I should even bother with writing at all. How much natural talent is required, and do I have enough? What if I work hard and keep at it, learn what I can, hone my craft, and my work still isn’t good enough? I know that no amount of work will guarantee that I’ll ever be published. I guess all writers face these doubts. The thing I keep coming back to is that I really enjoy writing and the writing life. My dear husband reminds me all the time that even if I never get to count writing as more than a hobby, if I enjoy it, it’s worth it. And the truth is, I don’t aspire to winning a gold medal. I’d be content just to qualify for the games. I mentioned Self Editing for Fiction Writers in a past post, but I decided that it really needs a post all it’s own. I originally purchased this book because I heard it recommended by so many people, including many multi-published authors. Quite simply, it is one of the most useful books about the craft of writing that I’ve read so far, and I’ve read many. I like to reread it about twice a year, just for a refresher. To share a little tidbit, the authors offer a formula they call 1 + 1 = 1/2. The idea is that when you put in two words, two sentences, two paragraphs, two scenes, two chapters, or two anything that are both there to serve the same purpose, you diminish the effect. That advice alone is worth the price of the book. If you aren’t pleased with your writing and don’t know why, chances are good that Renni Brown and Dave King can point you to the answer, or at least the start of one, in this book. I recommend it to even seasoned writers. If you’re a beginner, it may be a bit much to take in at once. Read it anyway. Let it sink in some; write more, revise more, and come back to it. You’ll “get” more of it the second time through. If you’re serious about getting published, this book needs to be on your shelf. Or better yet, on your desk, dog-eared, highlighted, and sticky-noted. One of the dilemmas that I am faced with as a writer is that of reading and recommending books about writing (although this can apply to any type of book). There are many excellent books out there to teach writers ways to improve their craft or increase their chances of publication, but many of them contain material that is offensive to me as a Christian–“filthiness”, “coarse jesting” (See Eph. 5:4), and the like. In some books, this is minimal, and can easily be filtered by the reader the same way we must filter speech we hear in our everyday lives. In other cases, however, this content is so pervasive, that it can make a book unreadable for a Christian. This is a problem not only in the reading, but also in the recommending of certain books. I have read books that contain a wealth of good information, but were so full of bad language and offensive humor that I felt it was impossible to recommend them. Take for instance Anne Lamott’s classic, Bird by Bird. I confess, I love this book. I think Lamott offers exactly the kind of encouragement that most writers need. But if I recommend it to fellow writers, will they think I approve of the language she uses? One of her chapters is titled, “Shoddy First Drafts.” It has some really important things to say about letting yourself write really awful stuff, because you can fix it later. But it’s title doesn’t actually use the word “Shoddy.” It uses another word with a similar sound. I could make a list as long as Rapunzel’s hair. James N. Frey’s How to Write a D*** Good Novel is full of useful advice, but even the title is problematic. Stephen King’s On Writing contains priceless knowledge, but is littered with the kind of language and base references you’d expect to find in, well, one of his novels. By endorsing these books, which contain profane material, I fear I could diminish my influence as a Christian and fail to glorify God properly. So why not just dispense with such books, and stick only with the ones that are relatively clean? That is one good option. I could end the article here, and it would be sufficient. There are plenty of good books about writing that aren’t full of profanity. 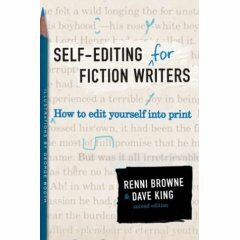 Self Editing for Fiction Writers by Renni Brown and Dave King comes to mind. Rarely will you find such a useful tome, and while there is a smattering of unclean language, it does not dominate the text. Edit as I read. I read with a marker or correction pen and obliterate the undesirable text as I go. Since I’m not planning on selling or distributing my censored copy, I have no qualms about doing so. I know that most authors would rage against me and call me a communist for it, but when it’s my own, private copy, for my own private use, I will do with it as I see fit. Recommend with a warning. If I feel compelled to point someone in the direction of one of my less-than-pristine favorites (perhaps because it addresses a particular problem they’re facing), I do so with a corollary. I let the person know what they’re getting into and make it clear that I don’t approve of the bad content. This may not be a fully satisfactory way of dealing with these books, but it’s the best I can do for now. What’s your policy, Christian? Leave a comment to share your suggestions. I’ve come up with a fairly simple way to avoid this kind of distraction. I’ve created an alternate user account for my computer. When I’m serious about getting some writing done, I log in using my pen name instead of my real name. My alternate identity doesn’t have Outlook set up. It doesn’t have my bookmarks list. It does still have Internet access, so that I can check words at Thesaurus.com, or do any other relevant research, but I’ve blocked my most tempting sites with Firefox Ad Block. If you still want to be able to access your writing from your main account, use the Shared Files folder. Just make sure that both accounts have administrative privileges, or you won’t be able to save any changes to your work while you’re using the limited account. I am a Windows user, so I don’t know if this would work with a Mac or Linux OS, since I’m not familiar with those systems. Of course, this doesn’t make it impossible to get distracted, but it does make it a lot harder, and most of the time that’s all I need to stay on track. Being a writer takes a certain commitment. There are hundreds (thousands?) of books, articles, (blogs) and websites out there to tell you how to give writing your all, how to make it your top priority. But as important as writing is to me, it can never be my top priority. My first obligation is to God. If I haven’t got things squared away with Him, I might as well forget about this whole writing thing. That’s what this blog is all about–being a Christian first, and then a writer. I'm a "pre-published" novelist. Here I explore the writing life, particularly as I weave it into my life as a Christian. On the "About Us" page you can read more about me and my alternate identities. Thanks for stopping by! I'm honored by your visit and I hope you will find some worthwhile material here. Should I be Doing This?